When selecting a new air conditioning system, the number of brands seems infinite, and among those brands you’ll often find there are many different models to choose from. At Millie’s Heating & Air Conditioning, one of the brands we consistently recommend to our customers is Amana. Amana’s AC systems have provided exceptional performance and reliability for more than 75 years, which is why our Arlington, VA area customers have so many positive things to say about the Amana air conditioners we’ve installed in their homes. If you’re in the market for a new energy–efficient air conditioner, call Millie’s HVAC today to discuss our Amana products and find out which system is best suited for your home comfort needs. One of the Amana air conditioner’s we install is the ASXC18 model, which features SEER ratings up to 18, and uses the new environmentally–friendly R–410A chlorine–free refrigerant. This model also features a manufacturer warranty (some restrictions may apply), as well as noise–reducing features and a factory–installed air filter dryer. This model is also compatible with ComfortNet™ communication systems with a two–speed fan motor. With our quality installation and maintenance services, this Amana air conditioning system can provide you with reliable, energy efficient AC throughout the summer, and for many years to come. To benefit from the warranty and other benefits, you’ll want to speak with one of our Amana AC specialists before you decide on which model you want us to install in your home. We can provide you with all the details and information you need about estimated cost benefits and efficiency ratings. We have a few models to choose from, and we can go over all your options to help you select the right one. 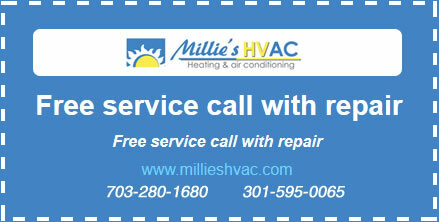 Call Millie’s HVAC today and let us know what questions you have about our Amana products. If you are looking for certified Amana air conditioner installers in Arlington, VA or the surrounding areas, call Millie’s Heating & Air Conditioning today. We have several models to choose from, and we can discuss the different features with you to help you make a decision. Call us any time to set up a consultation.